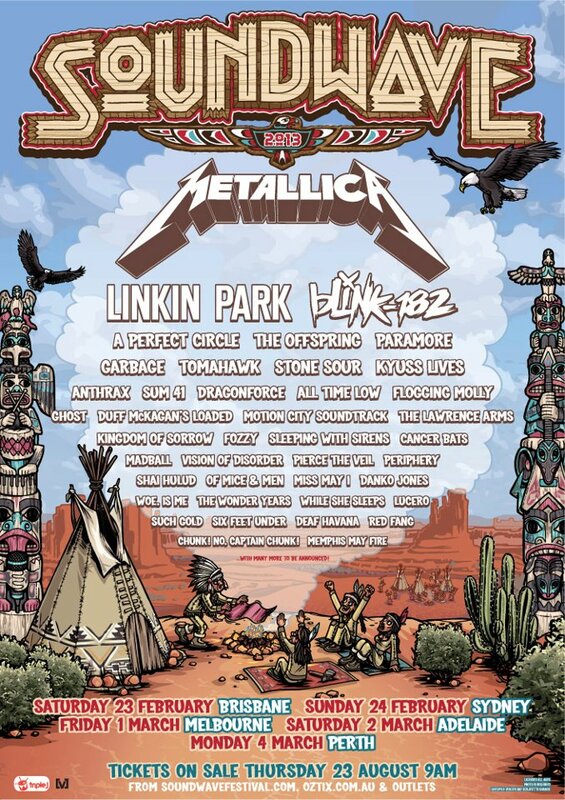 Last week the phenomenal line-up for the 2013 Soundwave Festival was announced and words can not express how excited I am to see these bands. As a fan of rock, punk & metal – both mainstream and underground – Soundwave has become something I look forward to annually as it’s like a festival designed just for me. The confirmation that Metallica will headline has completely made my year, I’m stoked to be able to see Blink 182 live again, especially since Travis will be joining them, and as Shirley Manson is one of my heroes I will definitely be front and centre for Garbage. Unfortunately, I am anticipating alot of clashes as there isn’t a single band on the bill that I don’t want to see – and there is still more to be announced! 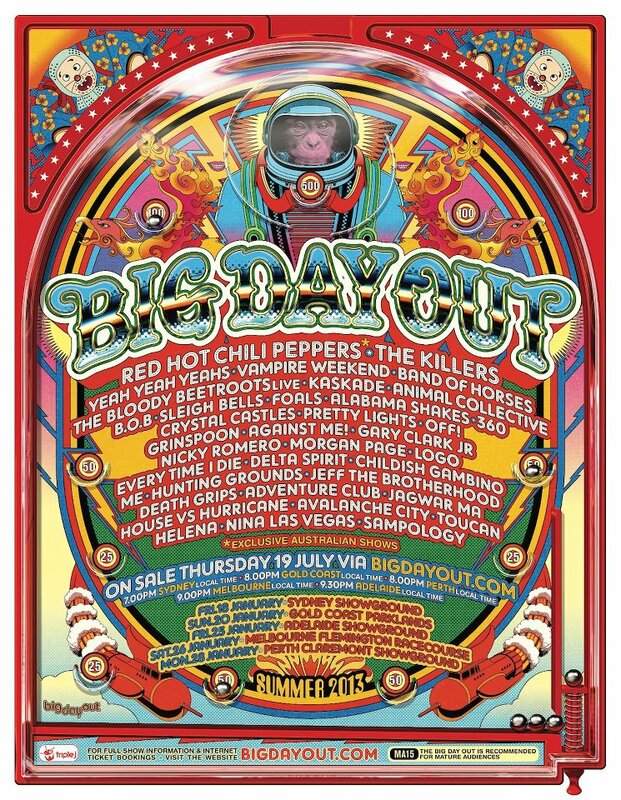 When I was younger, through the late 90s/early 00s, the Big Day Out was my ‘must-do’ summer activity, but I lost interest in the festival when I begin to feel that it (and its partner; ‘alternative’ radio station, Triple J) started to abandon the rock, punk & metal scenes and in favour of the hip-hop, electronic and indie pop cultures. One day I’ll write a separate post on my opinions of Australian radio stations but for now I’ll leave it at that. This year the BDO has done very little to entice me back. I was pretty stoked to see the the Big Day Out was bringing the Red Hot Chilli Peppers out again and I am pretty annoyed they apparently wont be doing any side shows. I’ll continue to hold high-hopes for an Against Me! side-show but the band I was most excited to see announced for the tour was actually oz-rockers Grinspoon. Its been a while but I’m psyched to hear their new album and I already have my posse lined up to attend any Melbourne show they do outside the festival – here’s hoping there is one. There are plenty of other Aussie Summer Festivals on the horizon that cater to a wide range of tastes. Homebake will be on again in Dec 2012 with, confusingly for a traditionally ‘home-grown’ line-up, Blondie as the headliners. The line-up for Meredith is still yet to be announced but oz classics The Sunnyboys have already been confirmed. If your more blues and roots inclined there is the Falls Festival or the Future Music Festival if you prefer the electronic & dance genre. So what does a festival mean to a fashion blog? Well, as an avid people watcher there is nothing better than a music festival for checking out ways to rock the latest trends. For example, at Soundwave 2012 there was no disputing that Black Milk was the brand of the day – their leggings where everywhere!! – and have been everywhere since. At festivals people let their individuality run riot with some pretty awesome outcomes – if I had a dollar for every swear word I saw printed on a t-shirt or jumper this year, I would have walked away quite well-off, some where exceptionally clever too! And above all, I love to see people immerse themselves in their music culture. 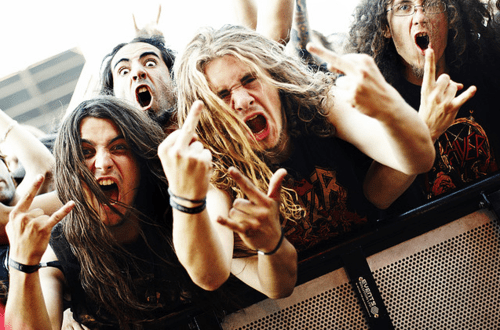 When Iron Maiden played Soundwave 2011 I was stoked to see the fellas with their acid wash jeans & mullets and this year I fully expect the black t-shirt brigade to be out in force in support of Metallica. A music festival is the #1 place to see ‘fashion inspired by rock’. Whether your trying to rock the ‘bohemien in gumboots’ look at Splendour In The Grass or your sweating it out in your skinny black jeans & hoodie in a Soundwave mosh pit, at a festival you go out of your way to put your music personality on show, and that, my friend, is what Dastardly is all about.